A realistic game with 3D graphics featuring all sorts of roulette: European with three sectors, American with a “double zero” or French with additional bets on sectors. Experiment and win! FREE CHIPS – Come back to the game every day and get free chips. 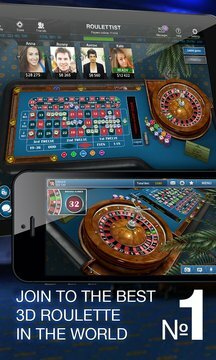 3D GRAPHICS – An absolutely free roulette game with stunningly realistic 3D graphics. PLAY WITH FRIENDS – Invite your friends to the game through email or Facebook and get bonuses as a reward. 3 VERSIONS OF ROULETTE – Try European, French and American roulettes and chose the best for you. CHAT WITH OTHER PLAYERS – Use the convenient chat and message system to discuss rounds you've won and get even more fun out of the game. CONVENIENT INTERFACE – A simple and attractive interface which gives you the ability to make bets quickly. LEARN TO PLAY – Are you new to roulette, but always wanted to try it? We'll help you take the first step and teach you how to play three roulette versions. NO REGISTRATION – Use guest mode to play roulette without registration. GET REWARDS – Place bets, take risk and unlock achievements. ONE ACCOUNT – Start playing on your smartphone or tablet and continue playing on Facebook without losing your progress. 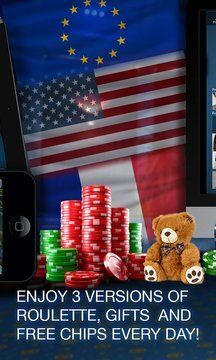 TEXAS POKER – With one account for Texas Poker and Roulettist you can use your contacts, achievements and chips in both apps.